Sometimes a really good project needs a really good before. This fireplace was actually removed from an upstairs bedroom during the renovation of our 1908 house. It’s been around through the invention of the electric toothbrush, sun tan lotion and scotch tape. The challenge of this piece? When we removed it, all the existing vintage tile around the surround cracked and fell off the insert. You can still see the lines where the original tile mastic was applied. I wanted to transform it. I wanted to introduce it to the year 2018. I wanted to create a look that was true to its vintage roots, but yet current all at the same time. That is a lot to ask of one project. Good thing I had a little help from my friends at Jeffrey Court. Can you just take a moment with me to scroll up and look at the before one more time? 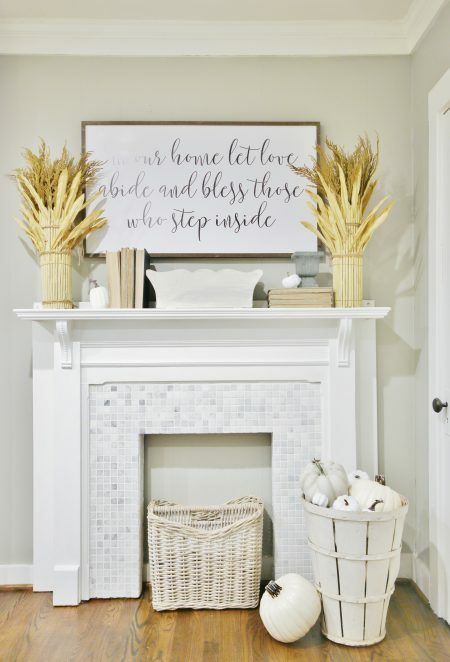 This is the perfect project for anyone who is intimidated by the words tile and cutter used in the same sentence. The project started with this tile. It’s Carrara White Marble in a 11.75 in. x 11.75 in. x 10 mm mosaic. What drew me to it was the dimension of the tile. Can you see the slight color variations? 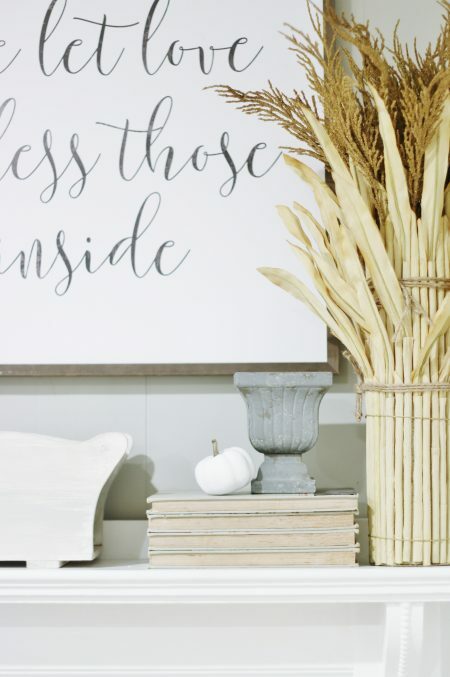 There’s gray and white and bisque and wheat all mixed together. 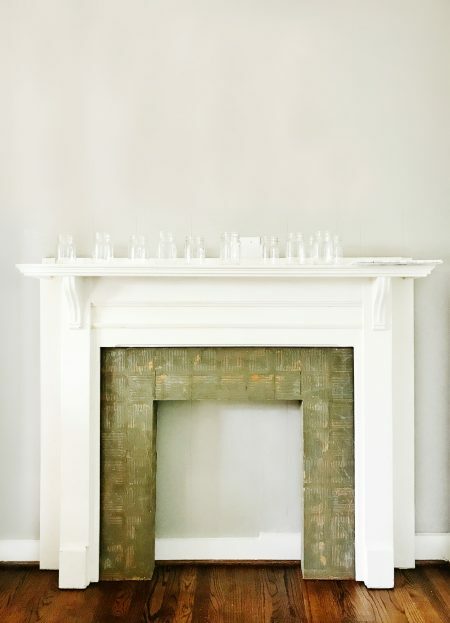 I knew it was the perfect tile to introduce the vintage white of the mantel, yet layer in a few more slight color variations to give the rest of the mantel depth. The project was relatively simple and took about a day. 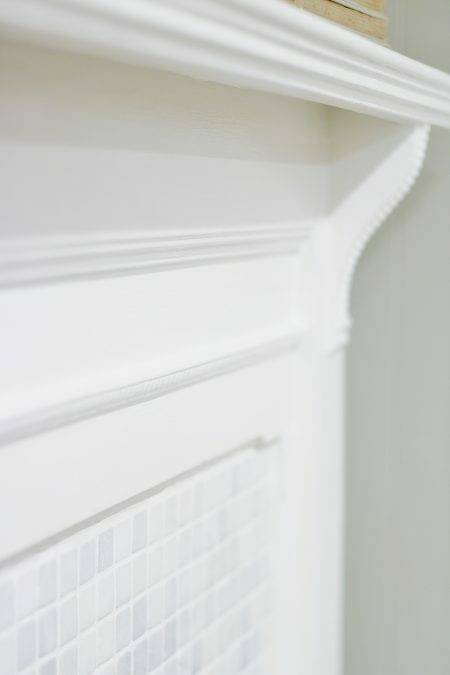 Here are the steps we took to transform the mantel. We lined up the tiles on the front of the mantel. Each piece of tile came with 10 smaller squares of tile on the same piece. Using a pair of scissors, we cut out seven squares of tile and attached them to the fireplace insert with thin set. You can find thin set tile adhesive in the tile section of your home improvement store. It usually comes in a tub like this. We spread the thin set on the fireplace mantel with a plastic trowel and then attach the tiles. 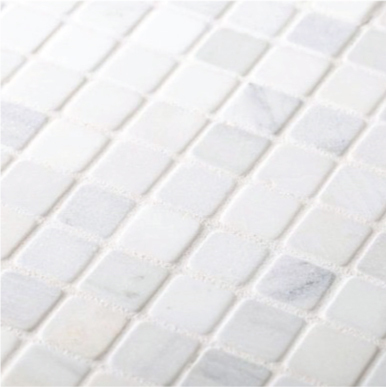 You want enough thin set to insure your tile adheres properly. Follow the manufacturer’s directions on your specific adhesive product. After we applied the thin set, we pressed the tile in to place. We kept placing tiles on the adhesive until the front of the fireplace was covered. We continued around the entire front of the fireplace insert with the same process. At the bottom it was a little like a puzzle and we cut apart some of the tile mosaics even more to make all the pieces fit. Once the entire front of the fireplace was set with tile, we started placing the tile on the inside. Here is a close-up of the edge of the tile. We abutted the tile on the inside of the fireplace directly behind the tile on the front. It fit in place seamlessly. We followed the same process as in step one, two and three and completely covered the rest of the fireplace, attaching the tile with mastic. We then let the thin set adhesive sit overnight. The next step was to apply our grout. You can buy grout pre-mixed or a powder form that you mix yourself. Because we were just grouting this small portion of the fireplace, I got the pre-mixed grout in white to save time. Using a plastic trowel, we applied grout in between the tiles, pressing the grout in the spaces with the trowel. After all the tiles were covered with grout, we went back and removed as much grout as possible from the top of the tiles. 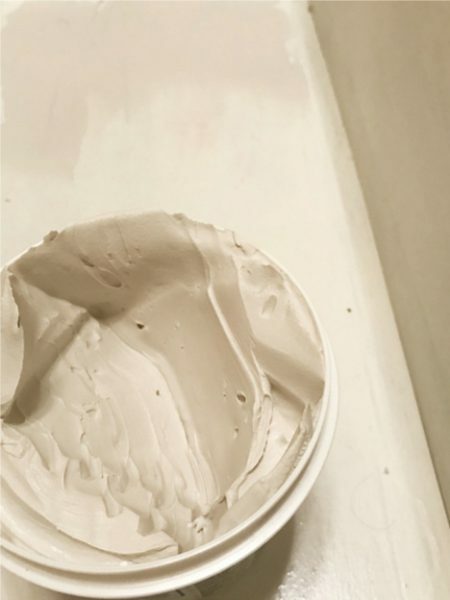 Working in smaller areas also helps the grout from drying too quickly.We followed the manufacturer’s directions on how long the grout needs to set up before we sponged the remainder off. We let our grout set up for about 10 minutes. Then we used a dampened sponge to wipe off the top of the tiles. We kept wiping until all the grout was removed from the top of the tile. 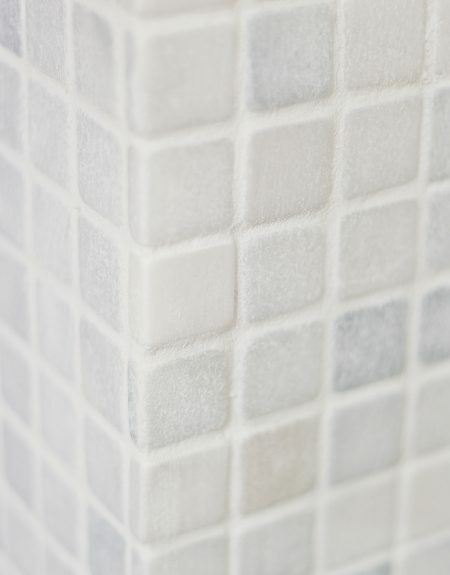 You want to wipe off the grout until you don’t see a haze on the tile. After we finished grouting and wiping down with the sponge, we still had a small space at the top of the fireplace where the decorative molding was attached. We simply grouted this area to blend in seamlessly with the rest of the tile. Can we go all before and after one more time? I love how the fireplace turned out. It looks so 2018 and so 1908 all at the same time. 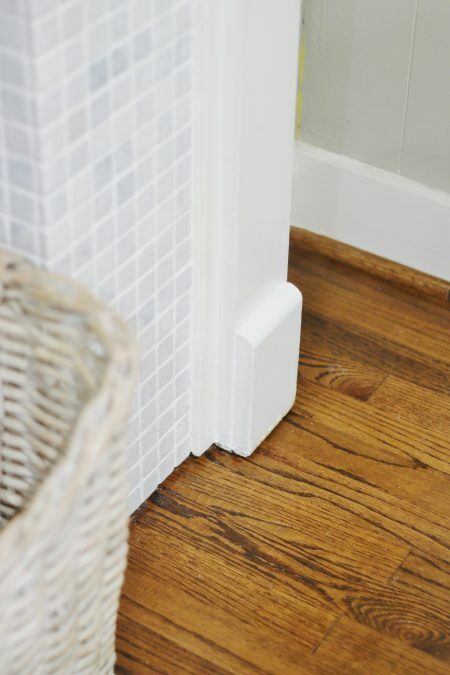 Isn’t it amazing what a little tile can do?